What a transformation! 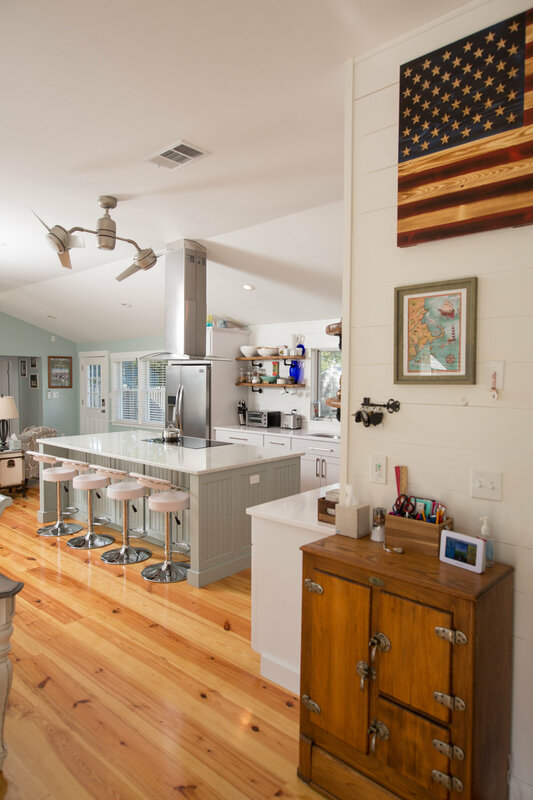 With a lot of vision and creativity, this dated dark cottage was transformed into a gorgeous bright beach retreat. We worked with our clients to select beautiful beach glass tones reminiscent of life on West Island and keep the floor plan wide open. Our client worked diligently to find the “perfect” shelving material that would be both unique and have some meaning. He struck gold with gorgeous reclaimed stair treads from the old mills in New Bedford. So cool! The end result is just breathtaking… and our clients couldn’t be happier. This makes us ecstatic! 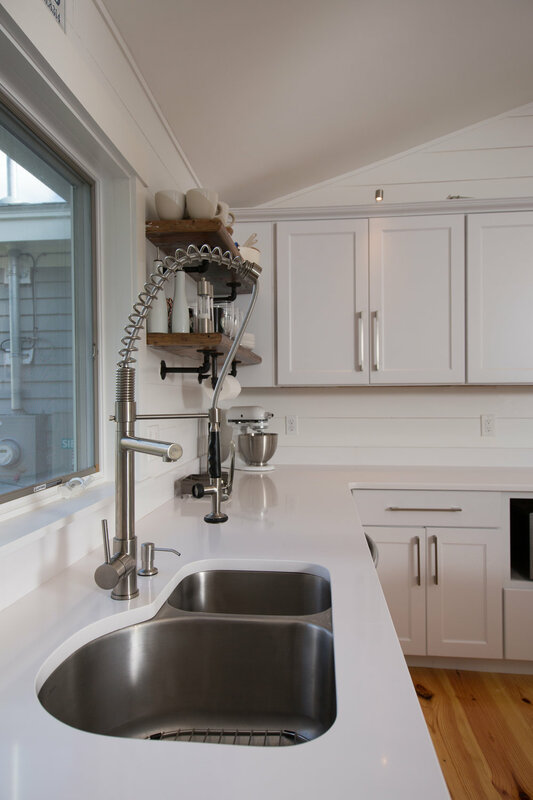 ‘Of all the mayhem that can go with a home renovation, our experience with Kitchen and Bath Details was by far the most enjoyable and fun aspect of our project. Working with Tena and Jill from the initial design concept, choosing finishes and the final delivery was low pressure and relaxed at every step. Our contractor remarked more than once on the precision and detail that came with the kitchen plans at delivery, and how they were the best he had seen, making his job much easier in his own words. 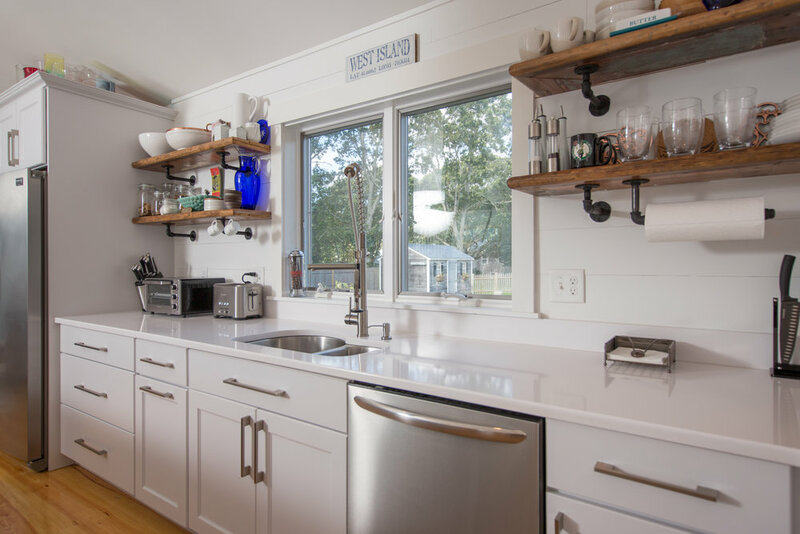 We achieved a dream kitchen that functions perfectly, all while combining today's technology with current design trends that tie modern clean lines with reclaimed and traditional elements of the cottage we renovated. We couldn't have done it without Kitchen and Bath Details. Tena and Jill have our thanks and appreciation. We can't speak highly enough of this experience, and recommend them wholeheartedly.’ Justin T.